This debate took place on Feb. 4, 2016, in the leadup to the New Hampshire primary on Feb. 9, 2016. 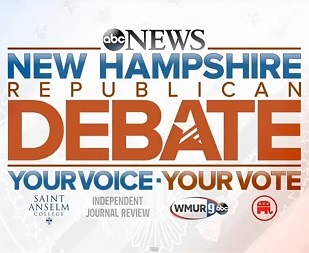 After watching several TV stations' "news" coverage of the New Hampshire primary results, we would like to point out to our readers how to watch these shows intelligently. Do not watch the live returns at all -- they are dependent entirely on which county happens to report first. At the national level, we all know that Florida and Ohio are important "purple states" -- but which are the "purple counties" in New Hampshire? The trickle of returns is meaningless unless you interpret them with a red-blue-purple analysis, and no one can do that except pundits with computers, and even they disagree. Set your alarm clock for 2 or 3 hours after the polls close and take a nap in between -- you won't miss anything! Ignore the polls leading up to each caucus and primary. They try to figure out which voters will go to the polls based on (a) asking; and (b) previous attendance. That ignores (a) voter dissembling to intentionally confound the mainstream media (especially Trump supporters, in NH); and (b) new voters (especially Sanders supports, in NH). Accounting for those shortcomings means all polls are guesswork, so why bother? The polls did not predict a Kasich surge! Fox News rambled on about how Sanders' "huge victory" will open the spigot to lots of campaign cash. In reality, Sanders enjoyed a net gain of 6 delegates -- he's now behind Hillary by 489 delegates instead of 495 delegates behind. That might "open the spigots" to some reegular people who look at polls, but the big-money donors look at the delegate counts. New Hampshire only matters at all because it is the first primary and hence a test of candidates' ability to get out the vote. New Hampshire is too small to matter much in the delegate count (which is why they insist on being first! Otherwise no one would pay any attention to them!) The N.H. Republican primary allocated 20 delegates out of 1,442 needed to win the Republican nomination -- a little over 1%. The N.H. Democratic primary allocated 24 delegates out of 2,240 needed to win the Democratic nomination -- a little under 1%. New Hampshire is a small state. And so is Iowa. CNN rambled on about the "importance" of this evening's events -- but that really means "self-importance" of CNN. N.H. and Iowa are news events -- they make the mainstream media breathless but hardly matter for the purpose of delegate selection. Fox News prattled on and on about Hillary's "strategic mistake" in going to Michigan over the weekend instead of focusing on New Hampshire. Fox News' commentators evidently don't understand arithmetic: Michigan has 147 delegates at stake while New Hampshire offers only 32. Hillary made a decision that she could gain only a delegate or two with extra effort in New Hampshire, but perhaps gain a dozen delegates by making a critical appearance in Michigan at a critical time. That means that Hillary focused on the overall delegate count instead of the "news of the day" in New Hampshire. That's called "strategy" -- not a "strategic mistake". The mainstream media report endlessly on the popular vote percentages -- but they do not matter! All the news networks spent hours studying whether Jeb Bush would pass Ted Cruz in the popular vote -- but the delegate count would not change at all, if he had done so! Both Bush and Cruz earned two delegates each -- and they would have earned two delegates each if Bush had somehow pulled "ahead" of Cruz by 400 votes instead of losing by 400 votes. (This is an ACTUAL "virtual tie", unlike the media reports of popular vote "virtual ties!" Remember that the purpose of primaries and caucuses is to elect delegates to the national nominating conventions, and select a nominee for the general election. The popular vote doesn't matter; "momentum" doesn't matter; and large states matter a LOT more than small states; because the only thing that REALLY matters is the delegate count. We report on the delegate counts resulting from the New Hampshire primary, because no other results matter.